Perched on a fertile peninsula, with a backdrop of steep mountains and lush tropical vegetation, the town of Madang sits beside a deep water harbour looking out across a scattering of perfect tropical islands. Widely acknowledged as one of the South Pacific’s most beautiful, the harbour boasts Kranket and Siar Islands, two of the most popular spots for swimming with their still blue waters. There is good fishing and diving along the magnificent coast, which is world famous for its coral gardens and superb visibility. Madang was the centre of heavy fighting during World War II and there are 34 sunken ship dive sites to explore at Hansa Bay near Bogia. The town has modern urban facilities, including hotels, department stores, bustling markets, historical artifact shops and displays in the Cultural Centre. The colourful Madang township has been called the "prettiest town in the South Pacific", a show-place of parks, waterways, luxuriant sade trees and sparkling tropical islands. Madang Province is a large region approximately 300 kilometres long and 160 kilometres wide, located on the north coast of the main island. The province comprises of reef-fringed lowlands, backed by some of the most rugged mountains in Papua New Guinea. The spectacular coastline boasts four large and many small offshore volcanic islands and coral atolls. The Bismarck Range lies to the south with heights ranging over 4,000 metres including Mount Wilhelm, PNG's tallest mountain at 4,509 metre. Also in the south, the Ramu Valley separates the Bismarck Range from the Finisterre Range to the south east of the province. The mountains are covered in large stands of trees and rainforest, whilst the coastal plain of the valley is open and studded with palm trees. The Bismarck Sea, which laps the northern coast of the region, is fed by the larger Ramu, Sogeram, Gogol and Malas Rivers. This active volcanic region is part of the Pacific Ring of Fire which has created crater lakes, smoking volcanic cones and black sand beaches. Many visitors come to Madang for the diving and snorkeling opportunities in the nearby waters. The shoreline around town also has many small sandy swimming spots with grass, large trees and shade. There is also game good fishing for kingfish, sailfish, tuna, mackerel, barracuda, yellow fin, marlin and wahoo especially off Bagabag and Karkar Islands. In the centre of Madang is a busy local market with a variety of fruit and vegetables for sale. You can see traditional clay pots being made at Bilbil villages just south of Madang. Some markets also sell artifacts, carvings, pottery, shell jewelry and bilums. Many of the small villages outside Madang offer tours to show you their local customs and way of life. A quick day trip to the picturesque Kranket, Siar and Samun Islands to swim, snorkel and picnic can also be arranged locally. Visitors can see the Elizabeth Sowerby Orchid Collection, cuscuses, hornbills, cockatoos and tree kangaroos at Madang Resort Hotel. A tour to the north coast will include a visit to a jungle covered WWII Japanese airfield and some pretty missionary stations also with a lot of WWII history. Madang hosts the Mabarosa Festival each year. The festival is a colourful display of dancing, singsings and bamboo bands. The air temperature in Madang is a constant 24ºC - 30ºC year round with the water temperature a ranging between 27ºC - 29ºC year round. The wet season is generally from December to April, characterised by calm seas and tropical downpours during the evenings. The dry season is from June to October and is generally hot and dry with strong southerly winds, which can cause the seas to become rough. Warm, fertile waters surge through the many passages and channels in the barrier reef around Madang, creating an ideal environment for a vast range of marine life. 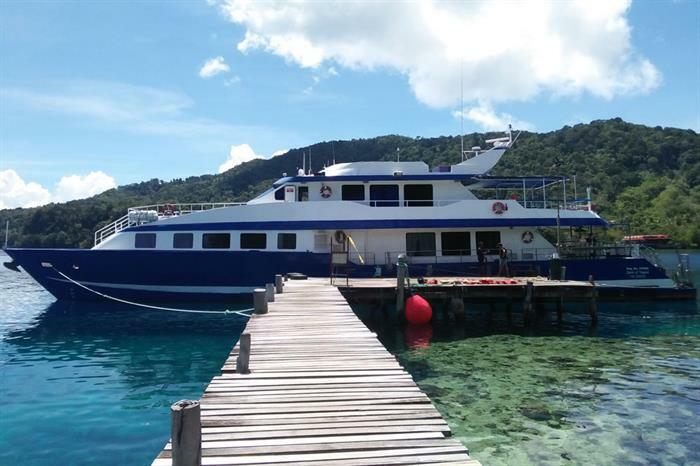 The variety of easily accessible dive sites include; coral walls with drop offs, gardens of soft corals, delicate gorgonian fans, a variety of pelagics and reef fish as well as a selection of interesting wrecks. Undoubtedly, the most exciting destination is Bagbag Island, lying 32 nautical miles off the coast. This small island has several excellent harbours used by the Japanese Navy during WWII. Approximately 10km long x 25km wide, the island was one of many peaks of a long mountain range pushed up from the sea floor by cataclysmic volcanic forces thousands of years ago - the peaks surround an extinct volcano. The closely neighbouring island of Karkar is still an active volcano. The other peaks remain underwater, sheer pinnacles that spear from thousands of feet to within 5 metres of the surface. Being so far from the mainland there are no estuaries to muddy the crystal clear waters. During the allied campaign to seize the Japanese strongholds north of Lae during 1943, Japanese anti-aircraft guns around the Madang coastline shot down many allied aircraft. The B25 Mitchell Bomber lies at a depth of 18 metres near Wongat Island. The bomber lost its port engine on impact, but apart from this, is virtually intact. The pilot, who was hidden by friendly villagers for several days, was eventually captured by the Japanese and transferred to a prisoner of war camp in Rabaul. He survived the war and has since revisited Madang to see his old bird. Penetrating through the cockpit of the aircraft you can peer down into the bomb bay, the doors of which were open on impact, into the rack of bombs still wired up and ready to offload. The gaps between the bombs are home to a collection of enormous crayfish. 50 caliber machine guns protrude from the aircraft’s turrets. This is a spectacular night dive. The 20 metre long freighter lies at a depth of 20 metres and is covered in prolific soft corals, sea fans and hydroids. The hold also contains the remains of a rusting dodge truck and some very large cod. Many species of "crinoid" can also be seen clinging to the rails and hatches of the wreck. At night their long feathery tentacles sway to and fro in the gentle current seeking to catch passing plankton. A 40 minute boat ride north of Madang brings you to this site with an almost vertical drop off to over 600 metres. The reef wall is covered in corals and has many overhangs and small caves lined by Sunshine Coral. A large range of molluscs favour this eco system – tiger cowries, the prized golden cowrie, spindle cowries and even the rare grand triton. Out in the blue you are sure to see some silver tip sharks cruising in the current and may even be buzzed by an oceanic white tip. The current at The Quarry is strong and unpredictable in that its direction can vary according to the depth. Just north of The Quarry is the USS Boston, an American liberty ship, which was converted into a minesweeper. The Boston struck the exposed rocky outcrop and sank to the bottom of a coral drop off in 30 metres of water. The wreck is about 70 metres long by 25 metres wide is virtually intact. On either side of the Boston project the long powerful booms which once swept the harbour of New Guinea's northern coastline hunting for mines. There are many large pelagics inhabiting the holds and superstructure of the ship, including sweet lips, jacks, spotted cod and barracuda. The holds are filled with crates - some intact and others broken open spilling their contents (such as typewriters, wine bottles, crockery and machine parts) on the decks.